Saving Public Access to Lakes and Lands in BC. Nicola Valley Fish and Game Club hasn't added a story. My name is Rick McGowan, I am with the Nicola Valley Fish and Game Club in Merritt BC. Our club is involved in an important lawsuit, our club and the BC Govt. are being sued by the Douglas Lake Cattle Co. Our club is trying to stop the illegal locking of public access to Public Lakes, lands and streams. The cattle company is owned by an american billionaire, who is married into the Walmart world. The BC Govt is taking< no stand >in this case and leaving our small club to try and defend all BC residents right to freely access all Public Spaces in BC. Our club cannot fund a lawsuit of this importance without the support of many of you. If we cannot be active in this action we fear that the Govt. and the ranch will continue to ignore the rights of all and corporate greed will prevail. We cannot lose this battle as the recreational future and access to many Public areas will be lost forever Thank You. Nicola Valley Fish and Game Club hasn't posted any updates yet. 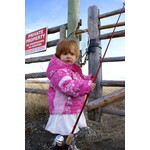 Nicola Valley Fish and Game Club is managing the funds for this campaign.